Today is my first adventure of being an Artist in Residence for the Sydney Heritage Fleet at Rozelle Bay. I sign myself in at the huge shed and don a bright red safety helmet, which means I can't wear my usual painting hat with the shady brim, but never mind. A plein-air artist can look like a beast of burden, bags attached to shoulders and weighing down each arm, all equipped for a good day's painting outside, the easel, canvasses, paints, bucket, brushes and of course some lunch, for this is an all-day affair, I have come a very long way today. I wander around all the very important ships and boats - there is the huge John Oxley balancing high above me on rows of blocks, many angles that could become a painting. Then there is the Kanangra ferry which does not present well from her side, but then I discover her lovely face, wrinkles and all, and that's where I spent the day, face to face with the Kanangra. 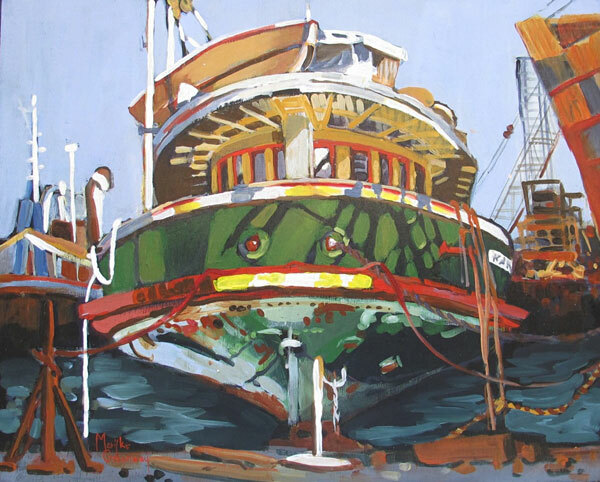 My easel was lightweight and wobbly and wedged into a tight corner where I watched, overcome by the industrious throngs of men who were refurbishing the boats. Bob and Peter said they had been there, working on the boats, for 20 years, almost a lifetime. A strange type of music was created by the rhythmic clanging on metal and the blasting of rivets high above me on the adjoining John Oxley. An aural experience that has been exhilarating and different. There was a pattern of hard shadow lines bending across her face and they were put in as soon as I had found her shape, for within 20 minutes it all moved east and the beautiful darks were getting away from me. Below her chin, reflections and rust dance and the light bounces back and I try to capture this in my painting. Instinct governs my palette and my brush filled my canvas with white, rust, slate and "She got the ferry green right!". I was lucky to catch her character so quickly, it does not always happen, but such is the magic of the Heritage Fleet site and her inhabitants.